One of the key pleasures and insights of staying with my friend Simon in Beijing was being able to get a chance to meet a few of the big name contemporary artists he deals with on a regular basis. His many years of experience and totally immersed language and cultural skills have put him right in the picture, to the point that he is a well respected and sought after as expert, critic and contact man in the Chinese contemporary, and (by extension) international art scene. Well, sadly I didn’t get to meet the famed Ai Wei Wei…perhaps a hope too high for such a short visit. But Simon, who had lunch with him last week, said that he is effectively under house arrest, or at least under constant surveillance, so it is understandably not the best time to meet new faces. He is certainly succeeding at being the thorn in the dragons flesh with his audaciously provocative art, architecture and controversial blogging. His role as a truth-speaker is not new to him. As a child he grew up in “internal exile” or labour camp, during the cultural revolution, where his father, Ai Qing, had been sent for his politically incorrect poetry. His gift as an artistic and cultural dissident are clearly inherited, though he has taken it to another internationally famous level, where the Chinese authorities appear to be struggling to find the best language and ways to contain him. His physical containment of 3 months must have been very distressing and did shock him into a moment of silence: though now he is speaking out for other artists and members of his circle who are still incarcerated. The cynicism of his release just before Hu Jintao’s recent visit to the UK and Europe has given him new roles as an international political pawn (don’t forget he is a useful dissident for Western governments too) and as an national example to deter tax dodgers. Tax evasion comes across as a more shameful practice than speaking your mind to the Western audience, so this somehow legitimizes the Chinese governments detention of him in western eyes…though maybe not 3 months without council. The interesting fact of the matter though is that most Chinese people don’t pay taxes, so it’s a bit rough to be pulled up on that one! Well they are supposed to…and it is technically the biggest source of income for the government, but very few average citizens or small businesses do. What some of my friends here surmise is that Ai’s arrest is a portent of a new era of more thoroughly enforced taxation that they believe is inevitable, to fund the runaway development. Clever bit of ‘win win’ Chinese style really, the bad guy, with the big mouth, is a good guy to promote a new era of taxation. Simon interviewed Ai Wei Wei a few years a ago before his blog was shut down and his arrest. It’s a good read, check it out at http://www.utne.com/arts-culture/Ai-Weiwei-China-Artist-Dissident-Truth-Government-Protest.aspx? Look out for a new piece by Simon on Ai Wei Wei, post detention, to come out shortly. Ai’s story exemplifies to the max, what I learnt during my brief incarceration for my Fire Ball Sculptures, that the more you repress art the more the public are intrigued…..from there on it is self- perpetuating. Censorship of individual creativity is a very difficult subject for governments. I have been having interesting conversations with my new friend from Belarus on this subject, where the state apparatus is so overpowering and intact that personal expression is driven underground with secret theaters and art exhibitions. Repression is certainly going on here in China, I learn from many of the artists I met…to the point that they all know someone in jail for his art, but the government is still trying to present themselves to the world as a new open China with an up and coming cosmopolitan society. Meanwhile the Public Security Bureau is quietly and meticulously monitoring the content of public art exhibitions and if they see fit finding ways to shut them down and make life difficult for the artist. It is easy enough to keep people, ideas and images out of the public eye with a state controlled media. Their biggest problem is the internet self-expression platform, which they can only partially control, by banning things like Facebook, Flikr, Twitter etc. Wei Wei, with his well trumpeted international reputation is certainly pushing these restrictions to the limits and forcing the system to find their own creative ways of controlling what is below the surface, a deep seated malaise that runs through many levels of society….not just the art circles. A studio visit with Simon to one of Beijing’s more famous and flamboyant artists’ called Cang Xin (pronounced Tsang Sin. if that is any help), who is originally from Mongolia, but now a fully transplanted Beijing artist. 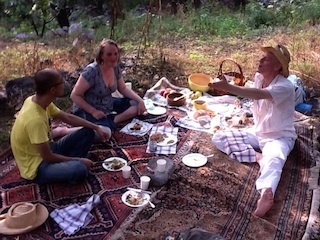 This was a fun afternoon outing that led onto a lovely dinner and introduction to his circle. Xin lives over the road, on the back side of 798, in a discreet complex of house and studio, down a scruffy lane. He has done well for himself, all from his art it seems. He started out in the field of performance art. One of his early works was of a photo book of him encountering strangers in different walks of life…workers, bus conductors, office girls…and then wearing their cloths and leaving them in their briefs for a picture shoot. They are a fun set of pictures that caused a bit of a sensation apparently! Another photo project was a series of pictures of him around the world doing the famous Cao Tao and licking the floor or street…anywhere from Tiananmen square to Paris, London or Sydney. He has a bit of a thing about licking. In his studio there is a big stainless steel bust of him sticking his tongue out to lick the end of a 20′ stainless steel machine gun. I like that one…bold and brave. We took pictures of us licking it together…along with the bust. We sat and enjoyed tea together in his well stocked library. One shelf caught my eye, with books on Jesus, Catholicism, Christian art and practical Witchcraft all stacked together. Another one had a bust of Ai Qing….rebel poet. Xin gave Simon and I a selection of his latest books. It seems to be the key thing amongst the artists here to publish big glossy books about yourself and work. In fact this was the cause of our tea time meeting. Xin wants Simon to write a piece on his work for the next book…Simon needs a bit of convincing, hence the tea invite. His studio comprises of a large gallery-size space, where the walls are covered in huge neat penciled drawings of Xin in various guises…looking like a Mayan god on a pedestal. Photographs of him naked and Buddha like on a mountain in Mongolia. He also has a few of his 2 and 3 meter burnt wooden carvings in fantastic germ-like forms. This series, called “Exotic flowers and rare herbs” he created with the help of forty wood-carvers from a southern province, who he engaged for a year to create the collection. What comes across here is his fearless…even audacious commitment to production. If only to have the money to spend and the cheap labour costs to set about this scale of creativity! There is a degree of madness and detachment to this level of art production though, and many would question the artist’s lack of physical contact with his work from start to finish. I don’t, and have come round to believing it is a very positive approach. Life is too short and we artists have way too many ideas that need revealing in the short time we have to get it out! By engaging others in the creative process, ones work becomes a life energy source for those that make it as well as those that enjoy it in the end. Many hands make light work. Xin is a people-magnet and our tea visit extended to dinner. Simon had to go off, so I stayed with Xin, who called up a posse of other artists, some of whom spoke some English, and we met up at a roadside, outdoor restaurant walking distance from the house. Here we toasted …or Gam beied … each other profusely with beer and enjoyed a large plate of spicy chilly split duck heads…as you do. It was a great evening and in fact a crucial stage setter for my up and coming week in Qinghai province. I had asked Simon for his suggestions on an unusual and remote part of China to visit…in the mountains and away from big cities. His top choice was Qinghai…basically China’s supposedly legit part of the Tibetan plateau. I booked a ticket right away. During dinner I was introduced to another friend in the posse, who was sitting on a nearby table, a performance artist called Hei Yue. I didn’t gather the details of his art, except repeated jokes that he makes his money by showing his arse to the world. I am sure I will find out more. Anyhow, he is from Xining, the capital of Qinghai. On being told of my impending visit to his province he immediately offered to connect me with his nephew, who lives there and speaks some English. After a quick call to Bing Bing, as his nephew is called, I am set up with a host and interpreter, who is told to meet me at the airport and do what ever it takes to look after me during my visit. Amazing the power of the artist quanxi. My next day in Beijing was an interesting and important visit to the workshop that had made my 3 meter steel ball for the symposium. They are situated out of town at the foot of the hills that harbor the Great Wall, a good hours excursion by light rail and taxi. True to form, Simon called around his network and found me a good-to-go young lady for an interpreter. English named Irene and I then headed off on a fun day of commercial inquisitiveness and personal quanxi building! The workshop is very unassuming, hidden away behind an unmarked gate in a low- tech brick walled industrial estate. The brother of the boss, the master-mind of my ball, (who I had met in Changchun) came to pick us up from the main road and drove us in. He was a lovely guy, very gentle and happy that we had made the effort to come and see their operation. We enjoyed a tour of the yard, which basically consisted of large open space, surrounded by some covered workshops. Various stainless steel constructions were going on in the open air and under drooping shade cloths. Worker lads, some of whom had been in Changchun, were out in force, grinding banging, polishing various stages of these huge sculptural components. It seems they get a lot of jobs from different city councils to build those huge, and quite often very ugly, abstract pieces that you see on the roundabouts or at the city entrances. They are also set up for finer and more artistic works. I noticed a number of large steel figures of fat sumo wrestler sorts, that are on display throughout the 798 District, plus a few standing Buddha pieces. All made laboriously with beaten stainless steel, if in multiples they are beaten over cast iron forms. The atmosphere was dedicated, with no frills or pretence. A lot of the lads live in-house, bunk bed style in one of the buildings, as does our host with his wife. I could easily envisage a creative stay over at some point to work with the boys to make another big ball…if my idea to enter the Sculpture by the Sea exhibition in Australia comes off for example. The day was very useful, to understand the production processes, location and atmosphere, as well as get some ideas of the cost involved. In brief, they are not as dirt cheap as ones dreams that Chinese production might have it. The materials are comparable to world prices, but what makes it workable is the cheaper labour costs. If my work was in plastic and mass produced in south China, that is were the ultra cheap production costs are! On my final day in Beijing before flying to the west, Simon organized a day out of town with some friends. A picnic at the Great Wall! A special day it seems even for veteran Beijingers. Slick as he is, Simon arranged for his company car, a lux extra leg-room BMW, complete with chauffeur, to pick us up in the morning. We were accompanied by an interesting internationalized German woman called Kirsten who is special assistant to the German cultural attaché at the embassy here. She is a fluent Chinese speaker and well connected with the art world, having been to Beijing Art Academy in the 80’s, where she broke tradition and was allowed to study traditional Chinese landscape painting…unheard of for a female westerner at the time. She is the daughter of the diplomatic circles and intelligent, good spirited company. We then picked up one of Simon’s top artists Mr Wu Jain’an, a great young artist who specializes in cut out paper and sheet metal imagery. Extremely detailed, fantastical, figurative and mythological silhouette works that I strongly relate to, being in the same field of play. He is a dedicated artist with a full-time studio, employing 6 assistants. He owns his own laser cutter which cuts his paper pieces out for him. His assistants range from a computer technician to semi skilled artisans to deal with the production steps, such as washing, staining and waxing the paper, before they are applied, by sewing (!) onto a bigger piece of paper. Wu speaks pretty good English and is well tuned on Chinese history and cultural knowledge. A good companion for a wall visit. When entering the foot hills and before meeting the wall, we dropped in for a late breakfast on another Beijing artist friend, who makes large photographs of subtly altered architectural models that she inhabits with scale figures, that tell various stories and dramas of the new China. Xing Dan Wen and her Dutch video-artist companion have bought up an old farm structure and are now converting it into a ‘get-out-of-town’ bolt hole. It has the makings of a cool country art studio. An approach that I am sure more city artists will be following, if the money keeps coming in. We selected a lesser-trod section of the wall, away from the tourist hot spots, where small bits had been restored, but most seemed to be in an original and walkable state. We had to approach it from the northern side, by clambering up a rough track, through a grove of nut trees. The landscape brings Tuscany to mind. On reaching the wall, the only way up was a shaky old steel ladder, into one of the old guard houses. It is without question a phenomenal human creation, breathtaking and mind-bending at the same time. The impact of seeing bricks and mortar on such a grand scale rolling and turning over every natural feature in it’s way, from horizon to horizon is awesome: the pleasure made stronger when shared with 3 experts on various aspects of Chinese culture. The conversations were interesting. I will not go into a full Great Wall history here…there are many good books on the subject, but it seems like the current visible structure is the latest remains of a long running Chinese habit of wall building. Various emperors and dynasties have been attempting to defend the northern boarder lands from the somewhat mythical Mongol hordes, since the 4th century or before. These walls have not all been along the same line, but have followed various territorial expansions and contractions. The famous and latest one that we stood on was the product of Ming engineers who created the definitive version between the 1360’s and the 1650’s, though many subsequent emperors and the CCP have put a hand to restoring sections since then. The most interesting and re-occurring thread to follow in the history of Chinese wall building is not its importance as a defense against outside invaders, more as a defense against inside dissenters. The rallying cry to defend the motherland is a common cry of empires on the make (or collapse) and many or most of the more belligerent nations throughout history have cunningly created monstrous threats in the minds of their poor innocent citizens. We have all experienced it, haven’t we? China’s foreign policy over the past few thousand years has consistently mastered the theme of being the victim, in order to justify huge armies and outlandish defense budgets as well as a bit of territory appropriation now and again. Wall building played an important role in the process of nationalizing the people and at the same time an excellent pre TV social control mechanism. Having a long running, hubristic, national defense project rolling over generations was a great way of keeping a potentially disgruntled standing army and population preoccupied, busy, divided and tired. It seems there are no surprises in history, the current round of mass city development in China, where the worlds resources are wastefully applied to thousands of uninhabited structures, can be seen in the same light as the wall projects. It was these, and many other fascinating topics, that accompanied our carpeted feast in the shade of a walnut grove, on the banks of a babbling stream. Idyllic picnicking in a once idyllic landscape, now inevitably struggling to cope with pesticide poisoning, pollution and the relentless population growth. 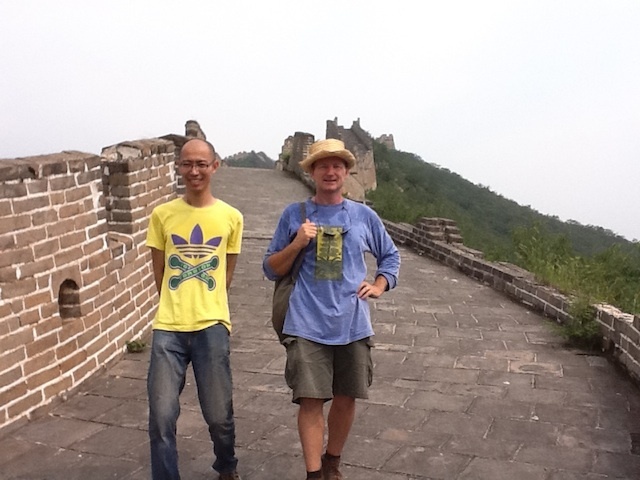 A great day, by a great wall and great way to end my inspiring and life changing first visit to the centre of the China vortex.